With horror the scale read 284.2 lbs this morning, about a 30 lb weight gain since end of April after taking part in the London Marathon. Over the past month or so the extra weight is making me tired, making me hurt again and I’ve stopped walking because its uncomfortable. A HUGE contrast to just three months ago. I’m disgusted with myself and have recently been feeling a little depressed about it all. My emotions are up and down right now in private. It’s easier to be my jolly self in public but outside of work I am a fairly quiet and private person needing time to think a lot and re-charge sometimes to the extent of being insular. Although I’ve been continuing to recreate wartime recipes, it has been quite some time since I followed a rationing plan day to day but really feel it is time to live and breathe this way of life from now until Christmas to get my back on the straight and narrow. I’ve done this so many times and it works incredibly well and I need to absorb myself into something all consuming in my fight against obesity. So today I’ve laid out my weekly rations (I have double the amount of cheese instead of my meat ration as I am vegetarian) and stocked my wartime shelves in my old larder and I will cook stew and potatoes later so I start tomorrow with food prepared and ready. 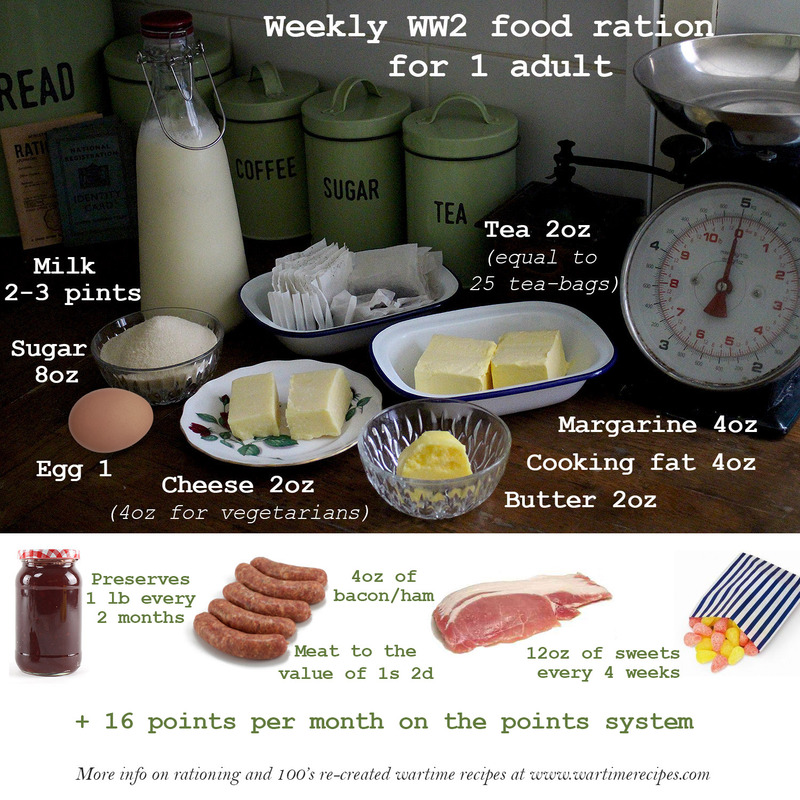 Food rationing started in January 1940. Not all basic foods were placed on the ration at one time, it was introduced gradually. Weekly allowances varied depending on the availability of foods but my diagram above will give you an idea of the amount of food an adult was guaranteed to receive on a weekly basis using a ration book. There were extra milk rations for small children and expectant and nursing mothers and they also received cod liver oil and concentrated orange juice. My weekly organic vegetable box will become my produce from my allotment/victory garden and be an important part of ensuring I feel full and eat healthily. You can do it! You’ve got 167 recipes to choose from at a minimum! I’m inspired by you! I too have gone up 30lbs in the last year. If I can get my husband on board, I’m going to start reducing our fat and meat intake and up the veggies. To victory!! You can do it! You inspire me! I too dear Andrea have 2 stone to lose after having a warning by my Doctor that I was a Diabetic and was to lose weight and take more exercise. after arguing with her that my blood sugar was not that bad I WOULD TAKE UP THE CHALLENGE andI did lose a stone in a month but now have to carry on as I do not want to have the diagnosis of being a Diabetic. Having both brother(deceased now at 60 and a sister with bad side effects of being over weight and a Diabetic I am determined to carry on to prove my Doctor wrong! Here is some unsolicited advice from someone who struggles with their weight. Up your egg consumption to 1 a day. Eggs help me stay fuller/satisfied longer. I would also suspect part of your struggle to stay on the wagon is the starches and root vegetables. If I eat too much of them they cause me to crave more. Then I fall off the wagon and start putting the weight back on. Stress tears me up too, because I’m a comfort eater. The best part is you are aware. Hang in there! Tweak your diet to suit your body’s needs. Yes I agree I too had to give up bread and any pastry or too many carbs.I found eating protein and vegetables good and to help with missing bread I found Ryvita very acceptable. I have had to be very focused and yes eggs are good and I still have some cheese and fill up with home made veg soups and salads of course! That makes two of us then. Like you I’ve done it before and like you it worked before. I love learning about the home front during World War II but never really got chance when my ex-husband was here to actually leave it. Well this time , I’m doing it properly. I go on holiday September 1 and when I come back I’m going to live the war right down to closing the “blackouts” or curtains, and observing rationing. I have a list that was given to me by the Imperial War Museum which details every change every Ration throughout the war, including the items on points. So for me September 2017 will be just like September 1939. We shall see how I get on, and more importantly how much weight I lose and how much money I save. One question though, I live in quite a Rural area, would they have had a yoghurt during the war? I would’ve thought that Rural areas may have got that but I can’t find anything about it. Any ideas? Good luck Carolyn the battle is so worth it, you are an inspiration to all of us and using rations is very sensible, we shall be joining you on this journey. I even try to walk to the shops as a women of that time would have had to do. best wishes from Judi. Oh, that’s super-clever with your weekly produce box standing in as your “garden allotment”! I’m tempted to try something similar with my local CSA. Great idea! I just wanted to say, please don’t feel disgusted with yourself, you are fighting a hard battle, and I know it must feel disappointing but at the same time it is even more inspiring that you are picking yourself up, dusting yourself off and starting again. I think (as a fellow sufferer) obesity is one of the most misunderstood and littlest sympathised with disease as well as being one of the hardest to conquer. Those addicted to smoking can just stop smoking and use nicotine patches. Drinkers can go cold turkey if they need to. Drug addicts have methadone. All of those have so much counselling and support available, but for the obese, we still have to eat every day. Every day we have so many choices and temptations. We can’t just say we are never going to eat again like the smoker can fore swear tobacco. You probably don’t feel inspirational right now, but you really are. My husband and I have decided to join weightwatchers and see where we get to by Christmas. I have a longer journey ahead of me, but we want to see progress. I am planning to think if it like wartime rationing to get me through. I have just started a new mailbox to add all your wonderful posts to. You should be so proud of yourself – you are honest and open about all you struggle with but your courage and optimism shine through every single post which is inspirational. I am a great admirer of Marguerite Patten and indeed all those fantastic housewives during the war who kept their families fed and healthy with such a restricted availability of food. It is embarrassing today the amount of food we waste. Our=r church ( Wesley Methodist at Christs Pieces) hosts Foodcycle which accepts left over/out of date food from the supermarkets and creates a three course vegetarian meal every Saturday for free for anyone in the Cambridge area. Keep going Carolyn – every day is a new day so you can have a fresh start as often as you like. Oh Thankyou for your kind words Carolyn, I could spend 24 hours a day just reading your blog and drooling over your recipes 😃 I am currently watching the 1940s house on DVD, I look forward to reading again tomorrow. You certainly are an inspiration to many of us. Hi Carolyn. Good luck with your plan. I’m curious to know what you eat for breakfast. Growing up, breakfast always included bread or toast but recently I’ve noticed that after I have toast in the morning I start to feel tired. I’ve started experimenting with reducing bread intake and it seems to be helping my energy levels. Muesli (or granola) is one of my favorite things to have in the morning (and fruit) and if I do have some bread I’ll balance it by having it with cheese rather than something sweet like marmalade. I’m a big believer in oats. I don’t know what it is about the bread. I suspect that it could be something simple like a sugar crash (especially if I have sliced bread – even though it’s whole wheat with lots of seeds – I think it’s too sweet these days). It’s possible that it’s gluten-related. If I have veggie sausages that are made from gluten I find them hard to digest. Have a nice weekend! Caroline keep it up you can achieve your goals. We are going to do this but i need ideas for hubbies packed lunch. But he has to be able to eat on the go. He doesn’t stop for lunch he is either in the truck driving or on the tractor so must be able to eat on the go! I find your blog so unique and well put together. Can’t tell you how much I enjoy the videos. Weigh is my bugaboo as well and it’s easy to get discouraged but you are an inspiration and I’m counting on you blog as encouragement. By the way , your accent is lovely , your blog is first rate and I look forward to watching you succeed.